Vascular malformations are present at birth. They never proliferate and never involute. 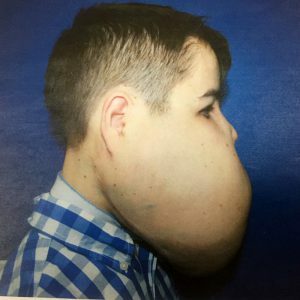 Instead, they increase in size steadily as the patient grows and they do so by an increase in the size of the vessels those make up the malformation. Vascular malformations are further classified according to the type of vessel that makes up the lesion. Port wine stains are the most common vascular malformations. They occur in about 1 out of every 1,000 people. A port wine stain is an area of skin in which the small veins just under the surface of the skin are dilated. This dilatation will increase the amount of blood in the veins and this will impart a reddish stain to the skin. The underlying cause of the dilatation of these vessels is believed to be an absence of innervations (nerve connection) to the muscle wall surrounding the small veins. Since the embryo develops segmentally (in parts, with each part developing independently), usually only one or two segments may be involved, occasionally, the condition can be more widespread. The absence of nerve connection will result in a muscle wall that has no tone (function) and this in turn will cause these vessels to dilate, hence the increase in blood volume in these vessels and hence the discoloration. Since the blood circulation is dynamic, the intensity of color will vary according to the volume of blood present within the vessels. Although we group all port wine stains together, there are clearly different types of port wine stain. To date, no sub classification has been proposed. Some port wine stains are darker than others. This is probably due to the density of affected vessels. Some are confluent whereas others are geographic in their distribution. The intensity of color will vary as the blood flow varies. When the patient is hot or angry, the flow of oxygenated blood will impart a more intense, reddish discoloration to the lesion. The process of aging will affect the port wine stain. A slow steady dilatation of the vessels will result in an increase intensity of color and as the amount of elastin and collagen diminishes, the port wine stain will thicken. Some will form nodules called cobblestones which can get quite large if left untreated. The age of onset of these cobblestones varies from the mid 20's to the 60's. It must be stressed that cobblestone formation is not inevitable. In an even smaller percentage of patients, there will be tissue overgrowth or thickening of the soft tissues within the affected area. The exact cause of this is unknown but it appears to be a segmental growth signal abnormality. Eye involvement without brain involvement does occur and is more commonly seen if there is skin involvement above and below the eye. This is not Sturge Weber Syndrome. These children should be seen by an ophthalmologist in order to correctly diagnose whether or not there is eye involvement and if so, to treat and prevent complications. Portwine stains were amongst the first lesions to be successfully treated by lasers. The standard of care at this point in time involves the use of a Pulsed Dye Laser. Almost all lasers these days have some sort of cooling device. Once again, an experienced physician is always desirable. The rate of complications is extremely low and in the vast majority of cases, the portwine stain should lighten significantly with treatment. Only a small percentage of portwine stains will disappear with treatment (10-12 %). There are a few important principles. Geographic, non confluent (normal/uninvolved skin within the port wine stain) do much better than confluent (NO normal/uninvolved skin within the area of the portwine stain). This does not mean that confluent portwine stains will not do well. Early treatment is advantageous. The younger the child the more efficacious the treatment. The very first treatment seems to be the most important, especially when dealing with a young child. Some areas appear to do much better than others. 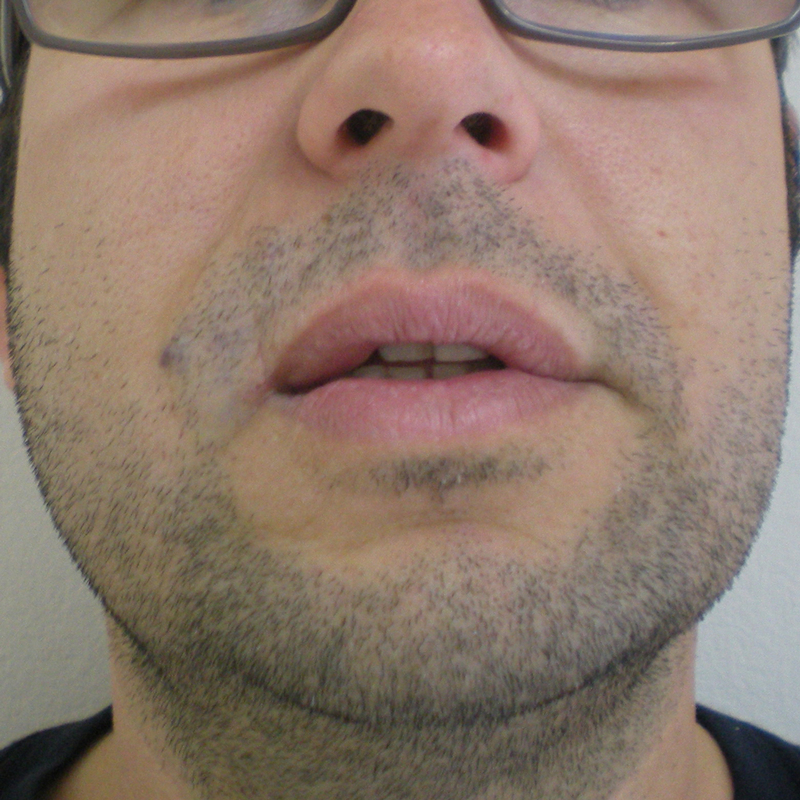 Central facial lesions do well. Forehead and eyelid lesions also do well, as do temple lesions. Central cheek portwine stains fare worst of all facial portwine stains. Shoulder and upper chest lesions do well. Upper arm lesions do better than the lower part of the arm. Hand and feet lesions do worst of all. One of the controversies concerns the recurrence of portwine stains after treatments. Since laser treatment is aimed at the effect and not the cause of portwine stains, it stands to reason that the lesion will eventually return. All this means is that the patient will need a "maintenance" treatment every few years in order to keep the desired effect. A small percentage of patients with portwine stains experience cobblestone formation and/or soft tissue hypertrophy. Cobblestones usually develop in the 4th or 5th decades of life and are nodules that appear on the surface of the portwine stain and over the course of several years, increase in size. Cobblestones can bleed, become painful and quite large. Soft tissue hypertrophy refers to a thickening of the tissues involved in the portwine stain. The tissues involved continue to grow. Growth takes place in all of the tissue layers and this usually commences and is noticeable at a much younger age. Both of these conditions can be surgically corrected. Once again, surgery is not "curative" but the results are usually long term. These lesions are made up of a plexus of dilated veins. Venous malformations can be localized or diffuse, superficial or deep. Certain anatomical sites are frequently involved; these include mouth, lips, tongue cheek, side of the face and neck. 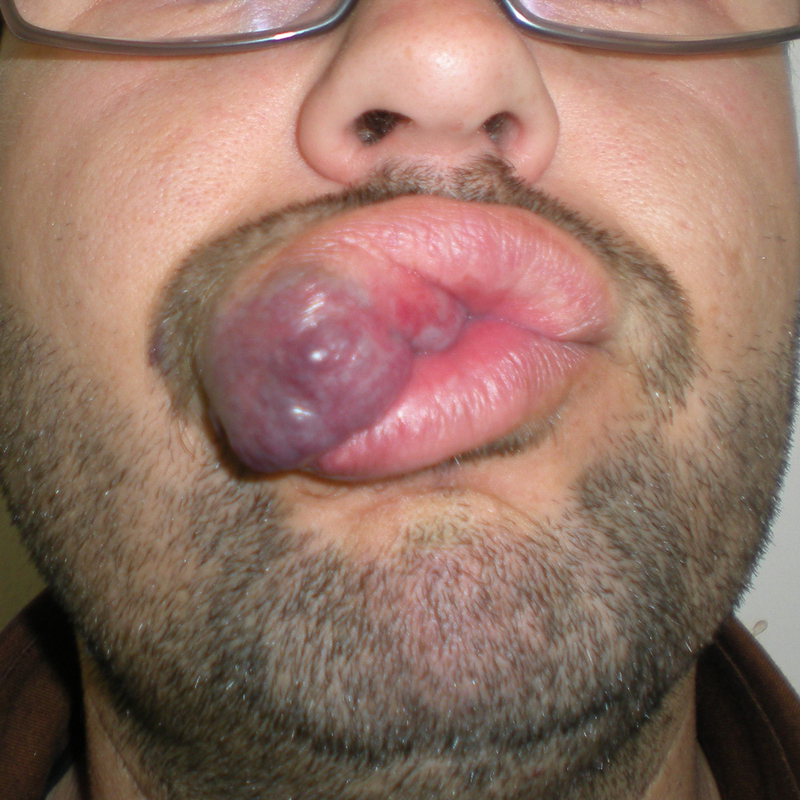 If the venous malformation is superficial, the skin and/or mucosa has a bluish hue. Since venous malformations are essentially on the venous side of the circulation, they will enlarge when the area involved is in the dependant position. As the patient gets older, the malformation will expand and if the overlying skin or mucosa is very thin, this can result in bleeding. Venous malformations may be multifocal and they have a spongy consistency to palpation. The underlying cause of venous malformations is probably the same as port wine stains except that the level of involvement is at a deeper level. Treatment with a Neodinium YAG (Nd:YAG) laser can be extremely effective for treating superficial venous malformations or it can be used to treat the superficial component of a deep lesion. It is essential that this treatment be done by a physician who has extensive experience in this because there is a very narrow therapeutic range. This means that the power settings necessary to obtain the desired effect fall within a very narrow range and will vary from patient to patient. If the physician wanders out of this very narrow range, scarring will result. It is important to note that a power setting effective for one patient, can cause scarring on another. It is thus critical that the treating physician be experienced in this form of treatment. The Nd:YAG laser is capable of effectively reducing the bluish discoloration of skin (Fig. 2) and mucosa (the lining of the lip and mouth)( Fig 1.). By using a cooling device together with the laser, the skin is spared and it is possible to treat through intact skin. Using an Nd: YAG laser with cooling, we have been able to successfully treat the superficial discoloration associated with these lesions. This is recent innervations. Laser treatment is thus often combined with surgery and sclerotherapy to successfully treat compound venous malformations. Surgical removal of the venous malformation can be staged (done in stages over a few months) or if it is possible, in one operation. The venous malformation is usually sclerosed before the operation. This will usually greatly facilitate the ease of surgery and greatly reduce blood loss during surgery. Regarding the extent of the surgical resection there are some points of discussion.A venous malformantion usually presents as a diffuse lesion. This means that the lesion infiltrates tissues indiscriminately and can be around important facial structure such as nerves muscles, bones, glands, etc.It is important to realize that the chief complain of the patient with a venous malformation in the majority of cases is aesthetic .Other cases do also have a profound functional impairment, for example an enlarged tongue because of a venous malformation results in speech, masticatory and swallowing difficulties. Both of these categories are treated, by removing as much of the malformation as necessary, in order to avoid damage to important anatomical structures, but on the other hand, to achieve the best possible esthetic and functional outcome. 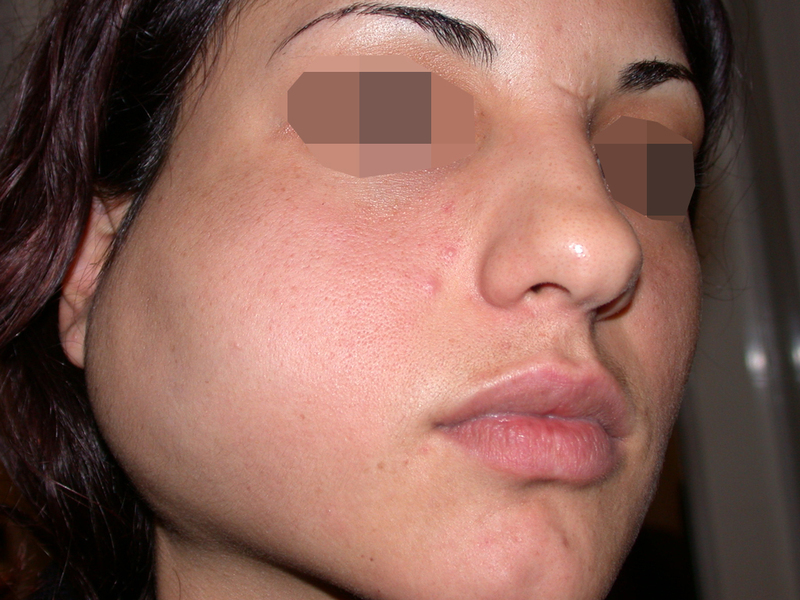 Vascular malformation is not a malignant lesion and should not be surgically managed with an amputation of facial structures. 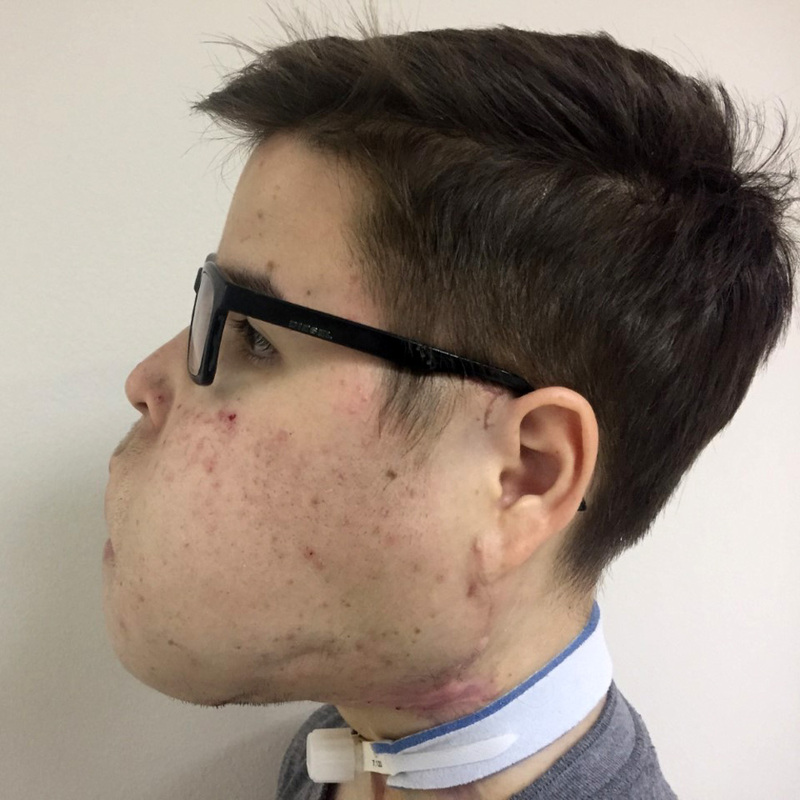 If a part of the malformation must be left behind, this part can be treated with the additional more conservative treatment modalities such as lasers and sclerotherapy. On the other hand, when dealing with a localized lesion with well defined margins, a complete removal must be attempted, having in mind the anatomical restrictions of the area. When there is a recurrence or regrowth of the lesion, the surgeon can utilize the three major treatment modalities in order to intervene; surgery, sclerotherapy and laser treatment or a combination of the above. In terms of managing the expected hemorrhage, the lesion must be treated with sclerotherapy before resection. This will minimize the bleeding during the procedure and will allow the surgeon to safely recognize and dissect the important anatomical elements and the margins of the lesion. Lesions that haven't been sclerosed preoperatively may be very difficult to manage intra operatively. The surgeon is also able to utilize all the available surgical aids in order to achieve haemostasis such as haemostatic clips, ligation of vessels, thermoscalpels, topical haemostatic agents, etcRemember that the attempt to provide a normal appearance of the face and correct the functional abnormalities without risking permanent damage to facial organs. The first is to achieve a dry surgical field (hemostasis) during the excision. The second is to reduce the lesion's size preoperatively, thus performing a less extended resection. The third is to further evaluate the lesion as during sclerotherapy we monitor under fluoroscopy the spaces filled with a dye before injecting the sclerosing agent into the lesion. In our treatment protocol we perform the sclerotherapy procedure 6-8 weeks before the planned surgical excision. 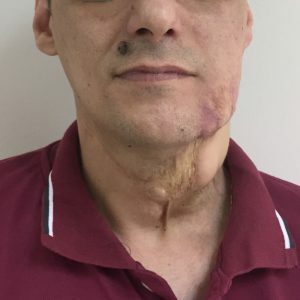 Our affiliated colleagues in the US have recently perfected a treatment whereby the lesion is first sclerosed and then within 24 - 48 hours, it is excised. Sclerotharapy as a sole treatment. When dealing with a diffuse or defined lesion and the patient does not want a surgical correction, we utilize sclerotherapy as the only treatment. Our aim is to control the lesion and thereby improve the quality of life of the patient. Arterio-venous malformation is a vascular lesion made up of small vessels linking the arterial side of the circulation to the venous side. These may be widespread, diffuse lesions or they may be localized, focal lesions. The overlying skin may be involved and in these cases, there is a pinkish hue. As with all other vascular malformations, arterio-venous malformations are always present at birth although they may only become evident at a later stage. Slow steady expansion will be seen and the supplying arteries and draining veins will also increase in size as the malformation enlarges. These lesions are fairly firm to palpation and are frequently surrounded by large dilated vessels. They usually do not expand when in a dependant position. Laser treatment has a limited role. A laser can be used to reduce the redness of the skin overlying an arterio-venous malformation. A pulse dye laser is used for this. The intentional closing of blood vessels - can be used in the treatment of many conditions. Sometimes embolization can be the sole form of treatment, but it can also be used in conjunction with surgery. An embolizing agent - a material used to seal the blood vessel - is injected through the catheter. There are a variety of embolic agents used depending on the specific requirements. They include: small plastic particles, glue, or foam; each has a specific use depending on the vascular disorder being treated. Treatment will usually consist of embolization, followed by surgical excision.The excision is targeted against the nidus of the malformation and follows the same principals regarding the extent of resection as mentioned in the venous malformations chapter. Many times a reconstruction of the defect is necessary. With the aid of our plastic and reconstructive surgeons we are able to utilize local flaps or free vascularized flaps to reconstruct the defect. There is a dilemma. If the AVM is extensive, it is important to resect only enough tissue to prevent a recurrence if this is possible. Resecting too much tissue, especially in the head and neck region will be too disfiguring. It is therefore important to avoid this and err on the side of being conservative. Lymphatic malformations are also known as Lymphangiomas or Cystic Hygromas. Lymphatic malformations occur when the flow of lymph across a region slows down. It is believed that the mechanism that transports the lymph is defective. Lymph will accumulate within these defective vessels and this presents as a mass.The mass will vary in size depending on the area of involvement. The mass is usually firm and is not compressible. If there is skin involvement, small vesicles can be found on the surface. If mucosa is involved, the same fluid filled vesicles can be seen. Since the flow of lymph can fluctuate, any condition that increases the amount of lymph will cause an increase in the size of the lesion. These include infections (usually viral), hormonal changes (pregnancy and puberty) and trauma. Lymphatic malformations can be made up of large cysts (macrocystic) or small cysts (microcystic). The natural history of lymphatic malformations is relentless expansion with advancing age. Some will enlarge more rapidly than others. These we call high grade lesions. Low grade lesions are less active, present later in life and expand much more slowly. The physiologic process that differentiates these 2 groups is unknown. Lasers are primarily used to treat the vesicles (small blisters) that appear on the surface of the tongue and mucosa of the mouth. We use a CO2 laser for this. 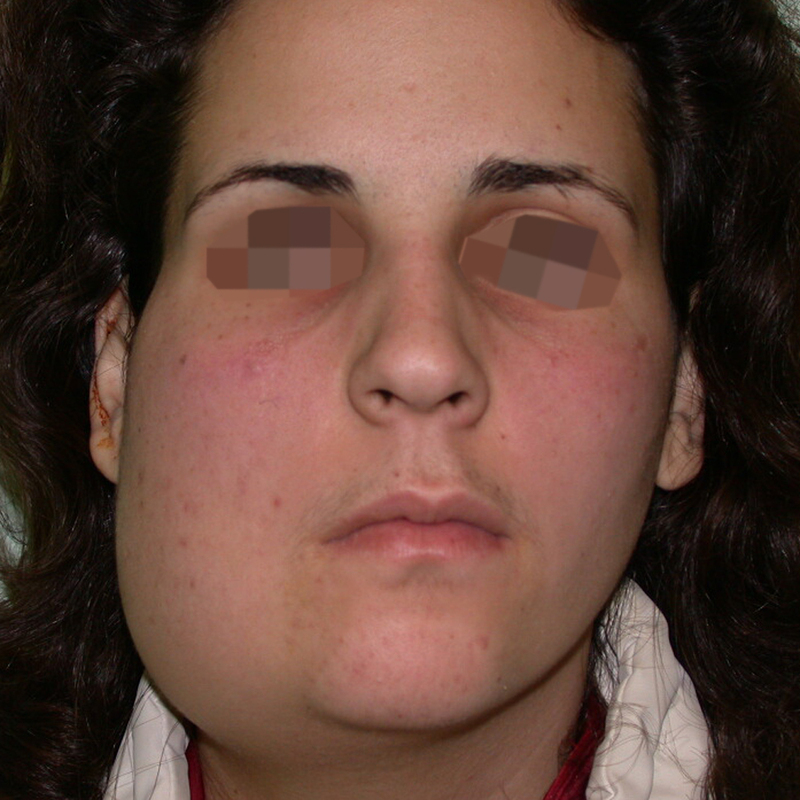 These patients experience significant symptoms as a consequence of these vesicles. Vesicles frequently rupture and a blood stained lymph will leak from these sites. In addition to this, these patients are unable to eat any acidic, carbonated or spicy foods since they experience a burning sensation. Since the lymphatic malformation may involve the entire thickness of the tongue, this treatment may not be curative, but it significantly improves the quality of life of the patient. The treatment is administered under general anesthetic and is usually done every few years. After a patient heals, most or all of the vesicles disappear. Two forms of treatment are used to treat lymphatic malformations, sclerotherapy and surgery. In general, sclerotherapy is effective in treating macrocystic lesions but less effective for microcystic lesions. Substances used in sclerotherapy include OK432, Doxycline and a number of alcohol derivatives. These agents cause an irritation of the wall lining the lymph cyst which then becomes inflamed and shuts down. In order for the agent to be effective, it must come into contact with the lining of the cyst. This is much more difficult when dealing with microcystic lesions. Surgical resection of lymphatic malformations can be undertaken, and in treating macrocystic lesions, is curable. With respect to microcystic lesions, recurrence rates are usually high and multiple procedures are usually necessary. The experience of the surgeon is extremely important, especially when dealing with lesions that involve the facial nerve.